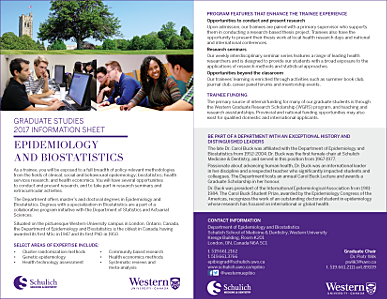 The Graduate Program in Epidemiology and Biostatistics offers both Master's and Doctoral degrees in Epidemiology and Biostatistics. Degrees with a specialization in Biostatistics are a part of a collaborative program initiative with the Department of Statistics and Actuarial Sciences. Epidemiology students are exposed to a full breadth of policy-relevant methodologies from the fields of epidemiology, biostatistics, health services research, health economics, genetic epidemiology, and program evaluation. Please see our admissions requirements and application information pages for details on admissions eligibility and application procedures. For more information on our degrees, please visit the program information and program requirements pages. NEW! We are now posting current research opportunities for applicants to our graduate program. Please review this list. It includes research opportunities posted by supervisors who are currently seeking students with specific interests related to their research area. For information on clusters of substantive expertise in research and commonly employed methodological approaches and disciplines for our department, please visit the Research Clusters page.